Creative Embellishments has a wonderful selection of chipboard, veneer and flair buttons perfect for embellishing cards. 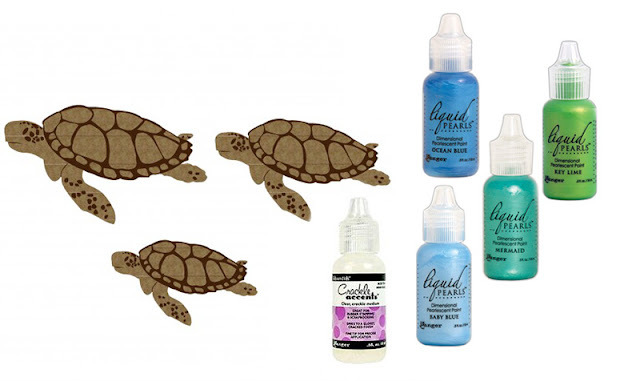 These products can help make your crafting so much easier. Simply pop them on a card and the magic is practically done. 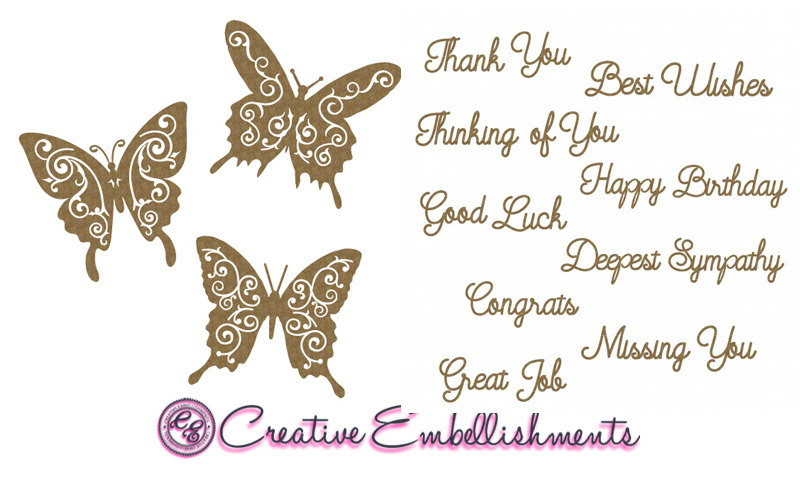 The Small Sentiment Words chipboard pieces are especially handy because the package contains so many options for expressing your thoughts. 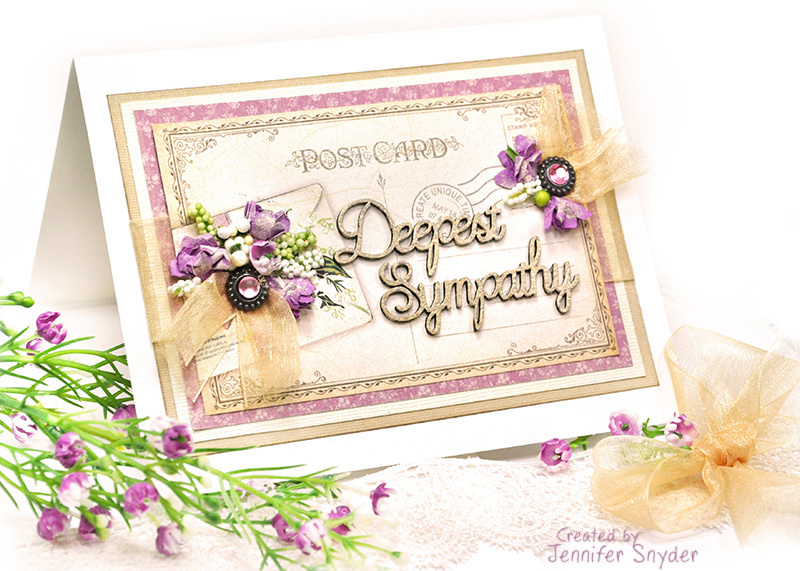 This is the second card. 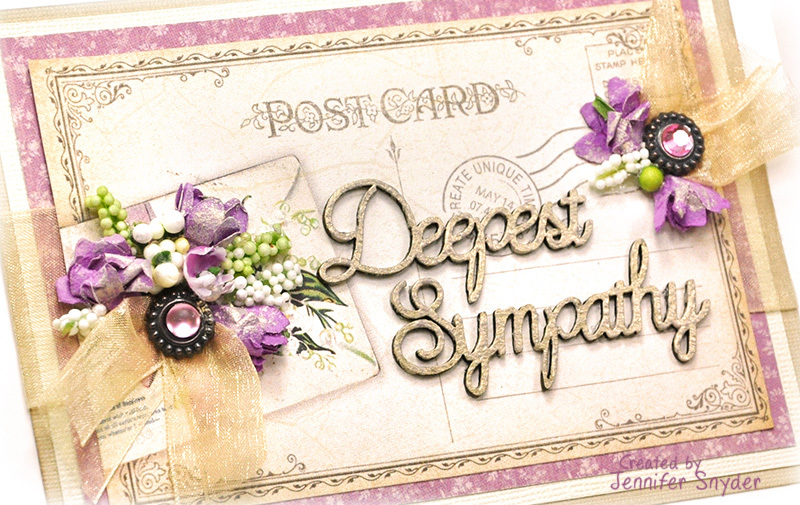 There isn't a lot to this card. 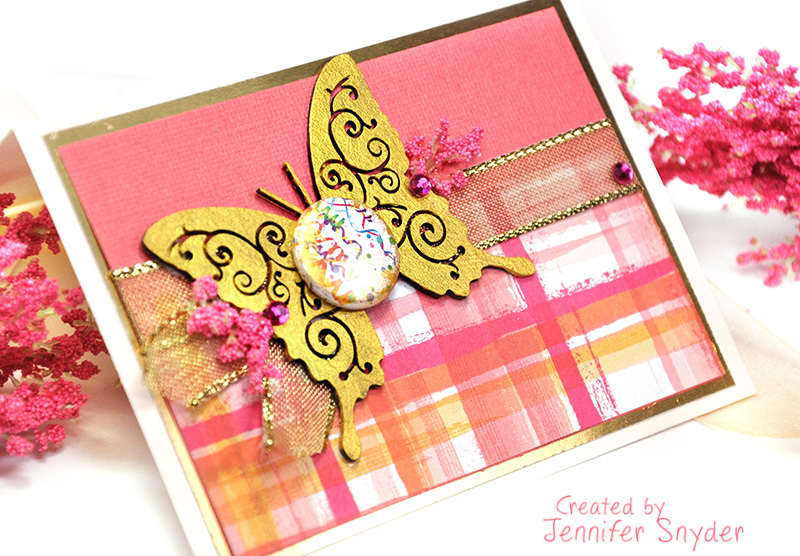 It was easy to quick, but the Flourish Butterflies chipboard piece makes such a lovely focal point. 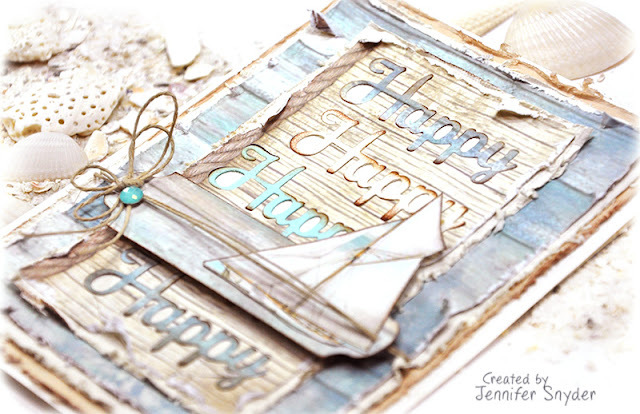 No fancy chipboard treatments needed. Simple is all you need sometimes. This has been painted with acrylic paint. 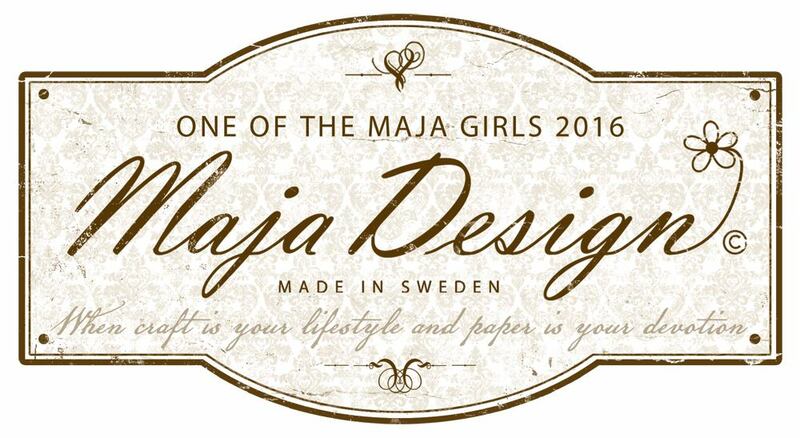 My paper choice is Graphic 45 Seasons Collection 12x12. I think I am missing the sunshine where I live. It's still snowing and cold. 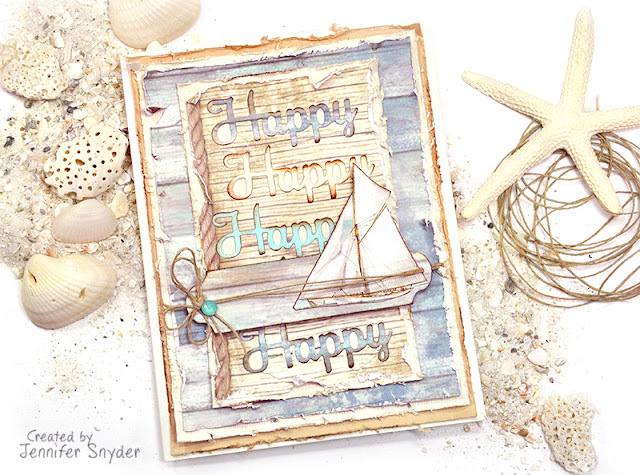 My mind is completely centered on sunshine, warmth and peaceful ocean settings. Those are my comfort thoughts. Spellbinders new dies helped me find my peace and tranquility. How adorable are these sea turtles? 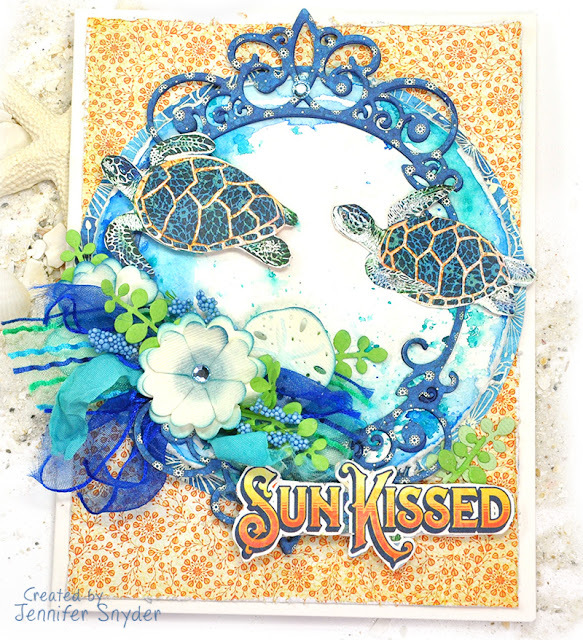 This is the beauty of the Graphic 45 - Sun Kissed collection. It's utterly delightful and captivates my heart. I fussy cut the sea turtles and mounted them on foam to make them come alive with dimension. Here are some cards that featured these same dies. 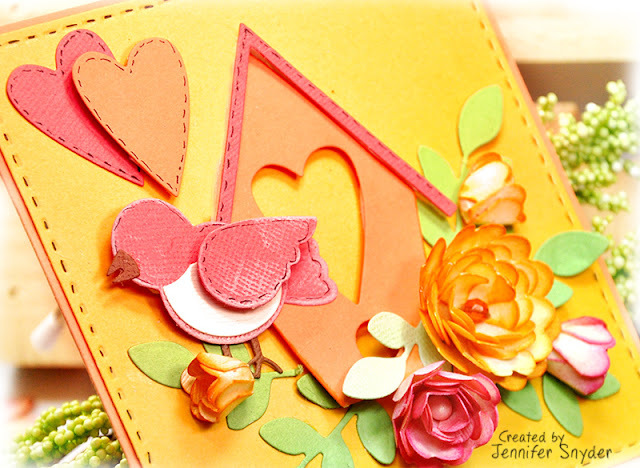 You can find the posts using Tammy Tutterow's Sew Sweet Valentine here and here . 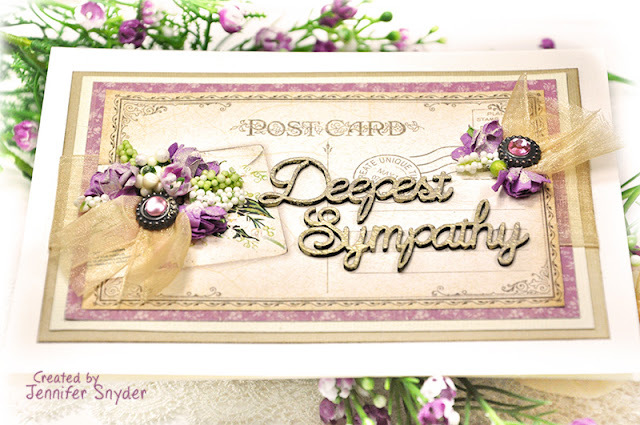 You can find more cards using here and here. 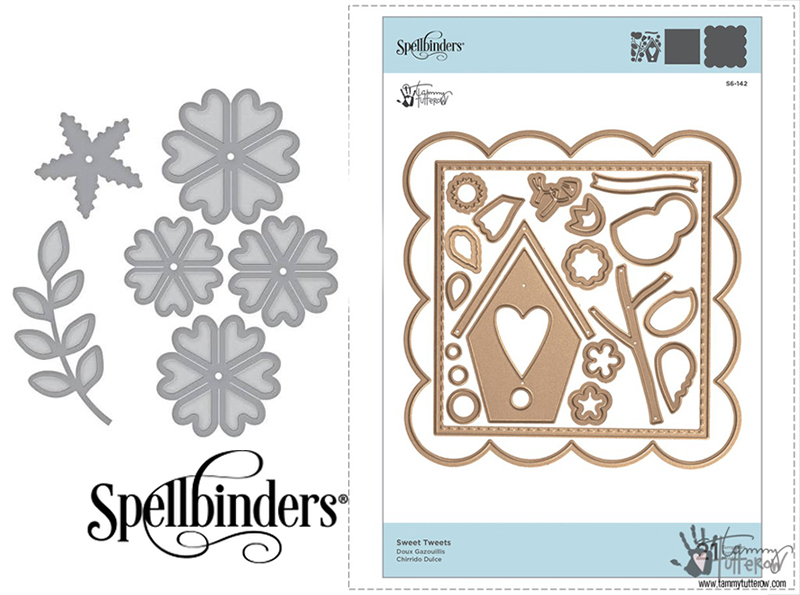 You can grab the Spellbinders dies by Tammy Tutterow here. 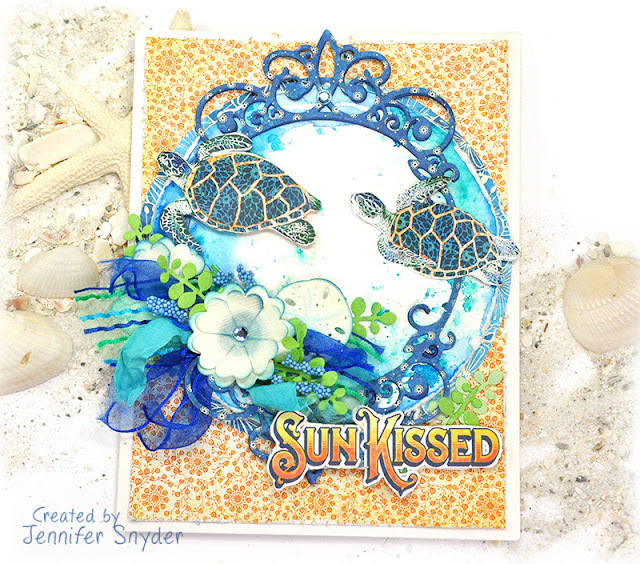 You can shop for Graphic 45 Sun Kissed papers right here. 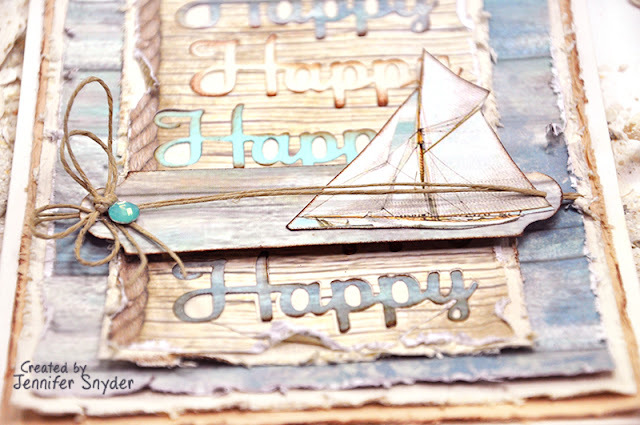 I'm here today to give you my version of a sea escape a la Creative Embellishments. The ocean is filled with wonder, beauty and a bit of mermaid magic. 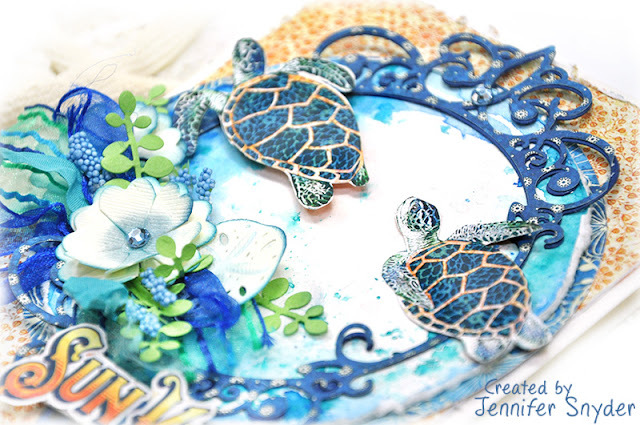 I made a giant tag expressing my love of the ocean and it's creatures. The tag features some really amazing elements from Creative Embellishments. Large Tags are so cool and trendy. 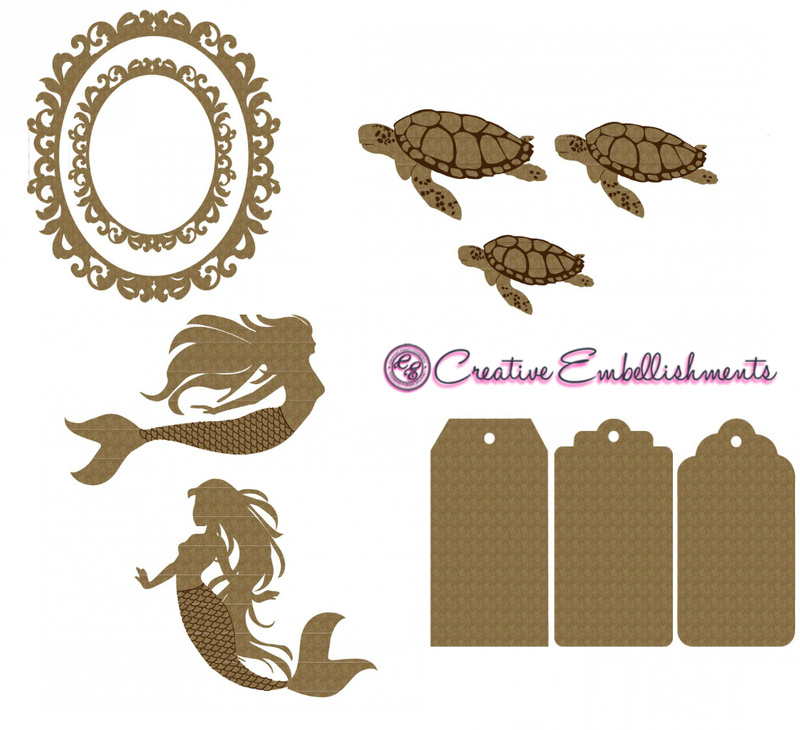 The large tags from Creative Embellishments offer a perfect blank "canvas" for these darling chipboard pieces and for your fabulous imagination. They offer 5in x 10in of work space...that's quite a bit! Plus they come in packs of 3! Yep - what a value! 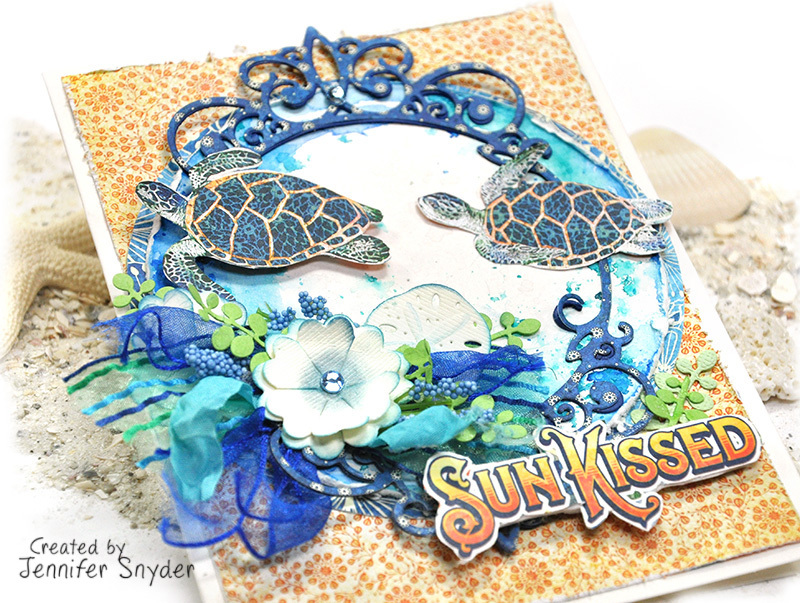 The sea turtle and mermaid chipboard pieces have gorgeous intricate details burned into the pieces that I wanted to highlight. 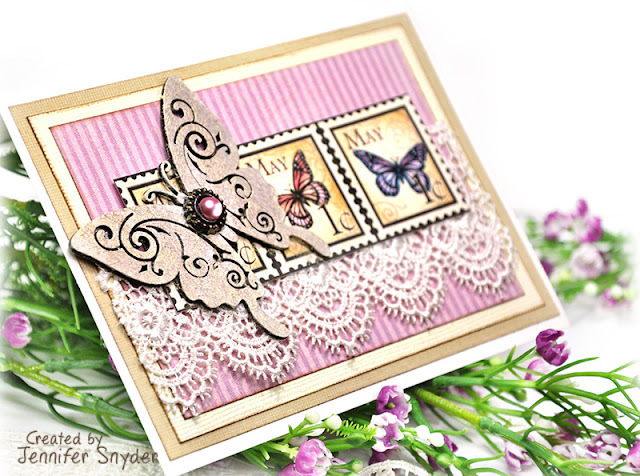 In order to work with the chipboard details and not cover up the fine details, I decided to dab on liquid pearls to color the pieces different colors. 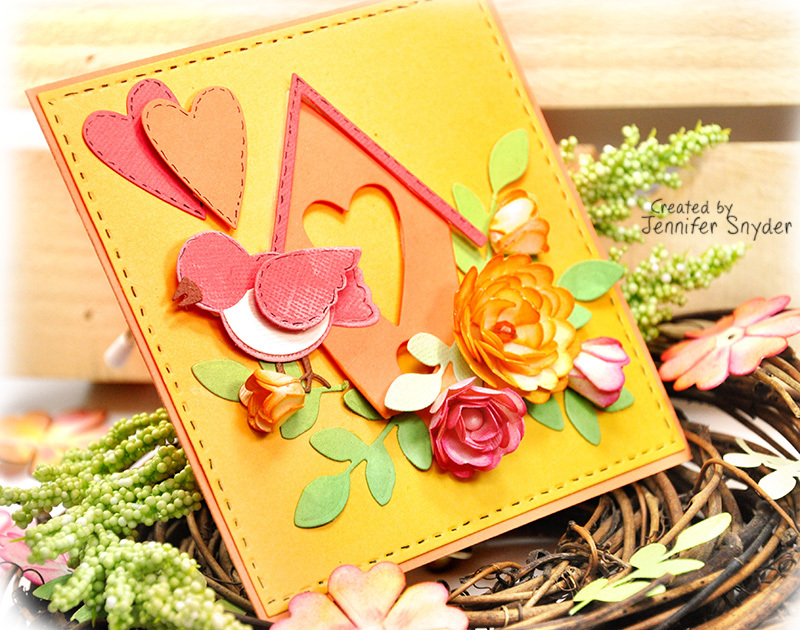 I felt I was not skilled enough with acrylic paint to stay inside the tiny lines so I needed a different option to treat the chipboard. Ranger Liquid Pearls come in an assortment of vibrant colors that do not bleed and run when applied to the chipboard. For me, these worked perfectly within the fine details of the chipboard pieces. 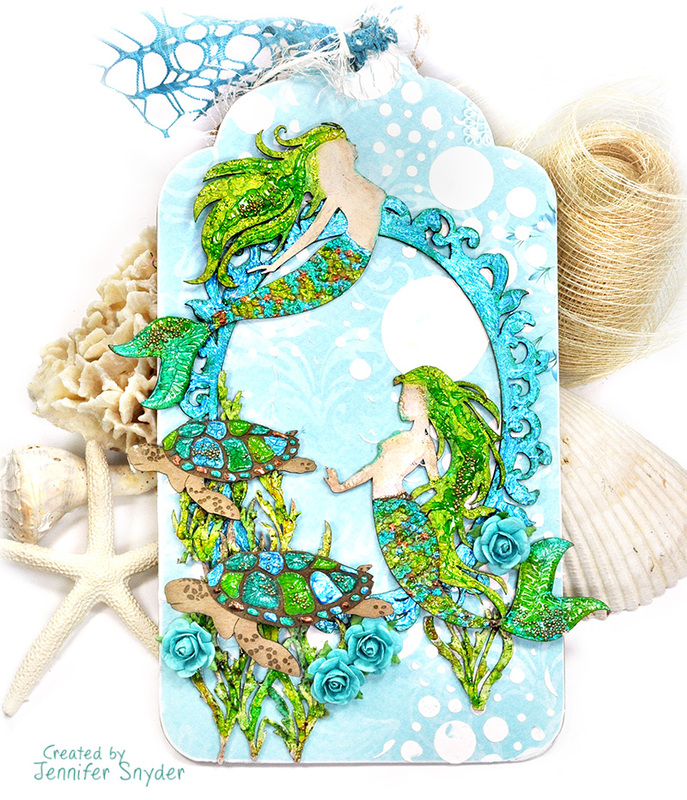 As a finishing touch once the liquid pearls were dry, I dabbed some Ranger Crackle Accents - Crackle Medium here and there over the top of the liquid pearls to provide the illusion of movement, especially in the seaweed and mermaid hair. As the Crackle Accents dried, I sprinkled gold micro beads on the chipboard (fine glitter would be nice as well). 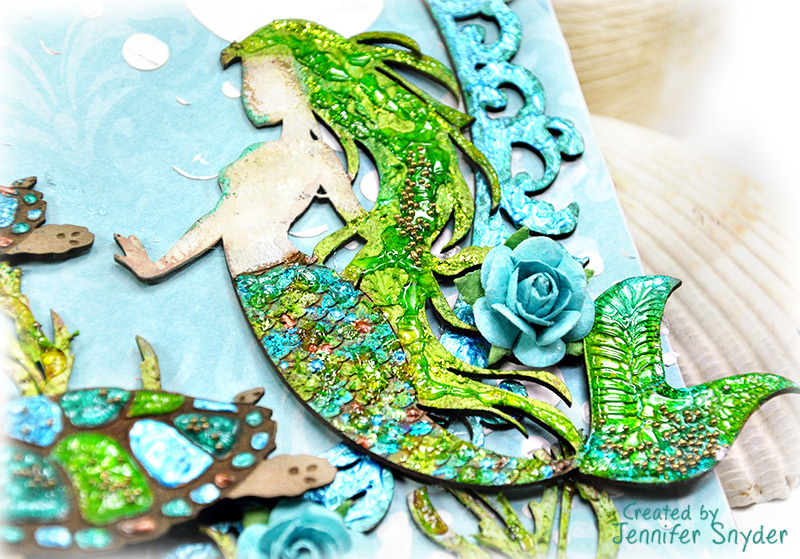 You can see how cool the Crackle Accents looks on the turtle shell and the mermaid tail in the next two shots below. 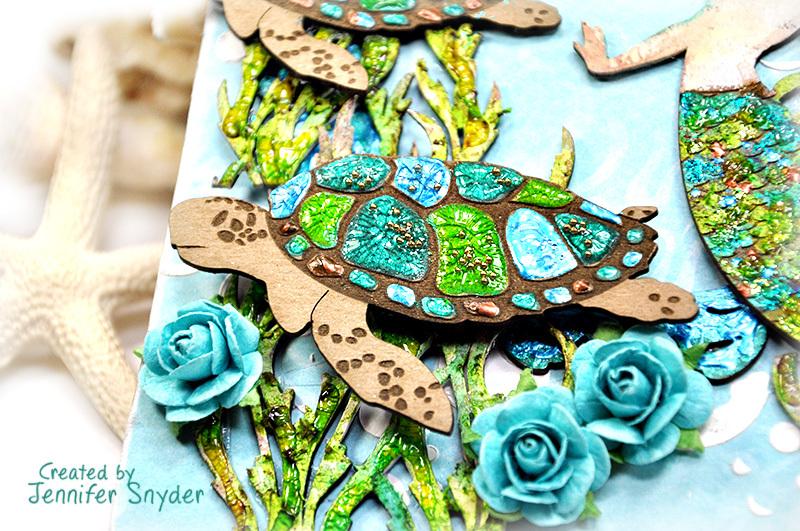 The secret to using Crackle Accents is to let the medium dry thoroughly - without using the heat gun. For me, patience may be the biggest challenge when completing any project. Patience you say????? Oh the horror of it! and Prima's Art Basics - Heavy White Gesso. This stencil is probably on of my favorites. It's just fun. and it makes great bubbles in the ocean. It's no secret that I love the seashore. I love everything about it's peaceful setting. It simply makes me happy. 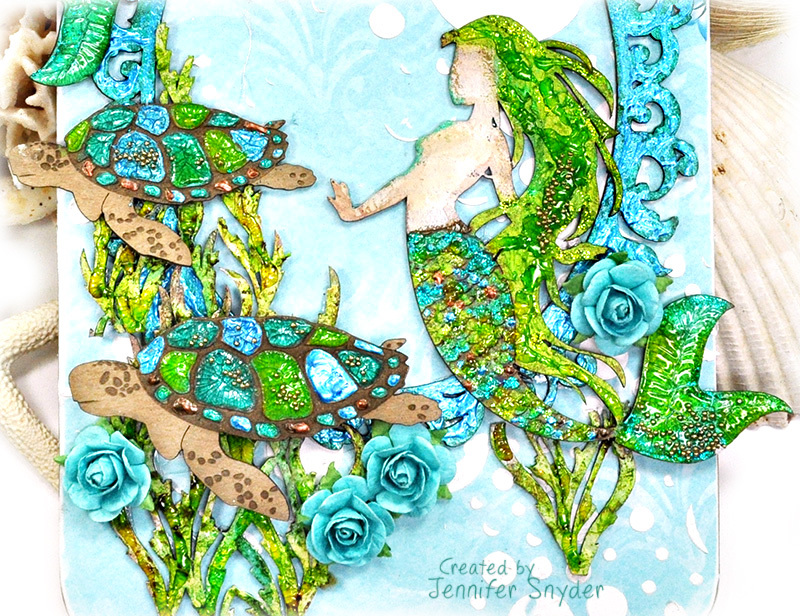 I also know I am NOT alone in declaring my passion for the ocean. Many folks share this feeling (and some of them live with me). I made this card to share the calming affect the sea has on people. 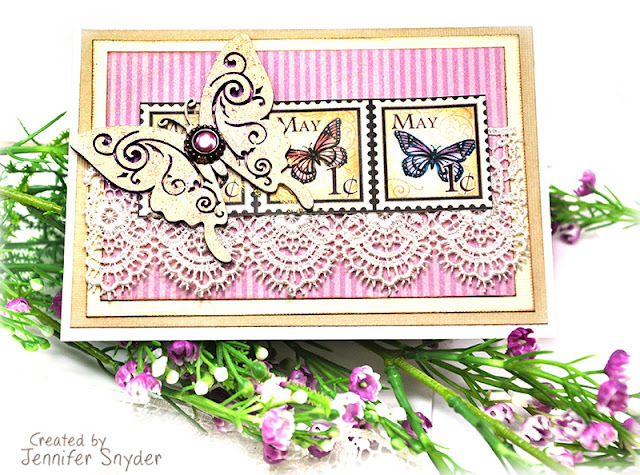 Even more exciting was the fact that I could use the new Oh Happy Day -Elegant 3D Vignettes Collection by Becca Feeken stamp/die set from Spellbinders. 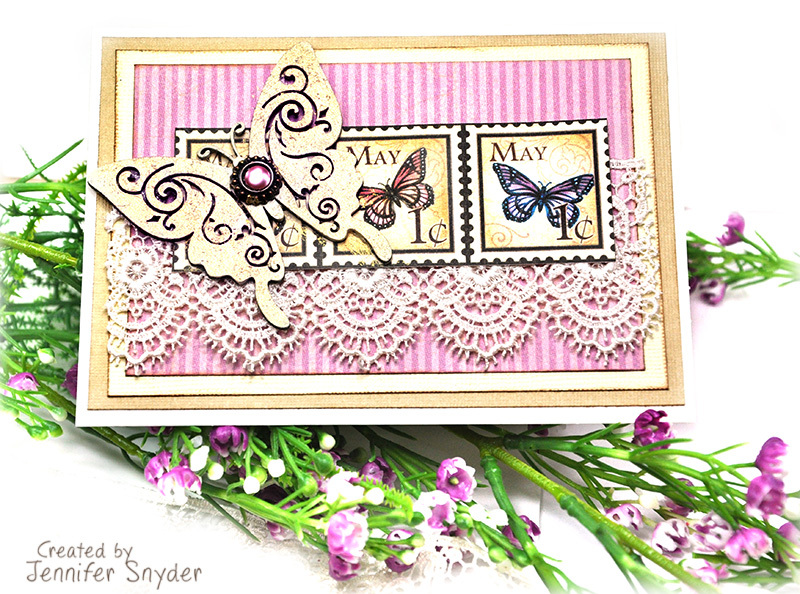 This fun and versatile set is part of the Amazing Paper Grace Collection which includes the newest line of products from Becca Feeken's Elegant 3D Vignettes collection by Spellbinders. I admit I used the Oh Happy Day stamp/die set from Spellbinders in a most unusual way, but it was perfect for how I felt. 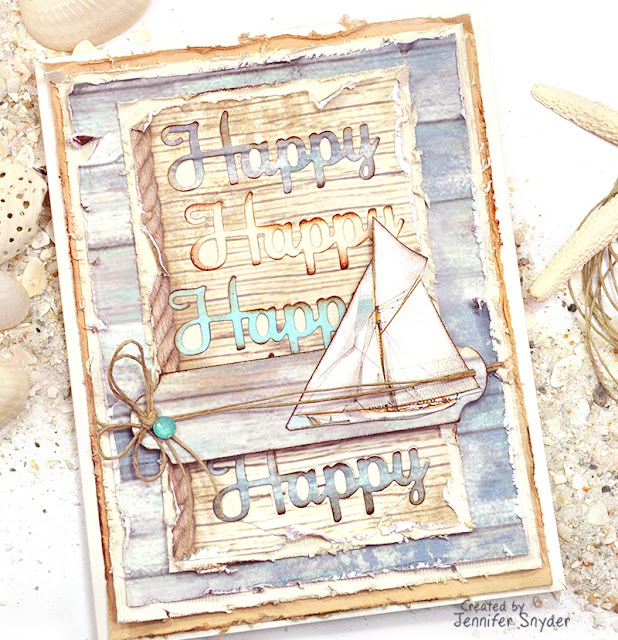 First - my paper choice is Stamperia paper - Sea Land 12x12 collection. Utterly divine and soothing. I diecut the word "Happy" from several pieces of paper from the collection, inked the words Walnut Stain Distress Ink accent, then pieced them all back together to create my card. The cool thing about this technique? That word "Happy" can be used to express joy for so many occasions - birthday joy, anniversary joy, friendships, love and even for a quick and fun "thank you " card. 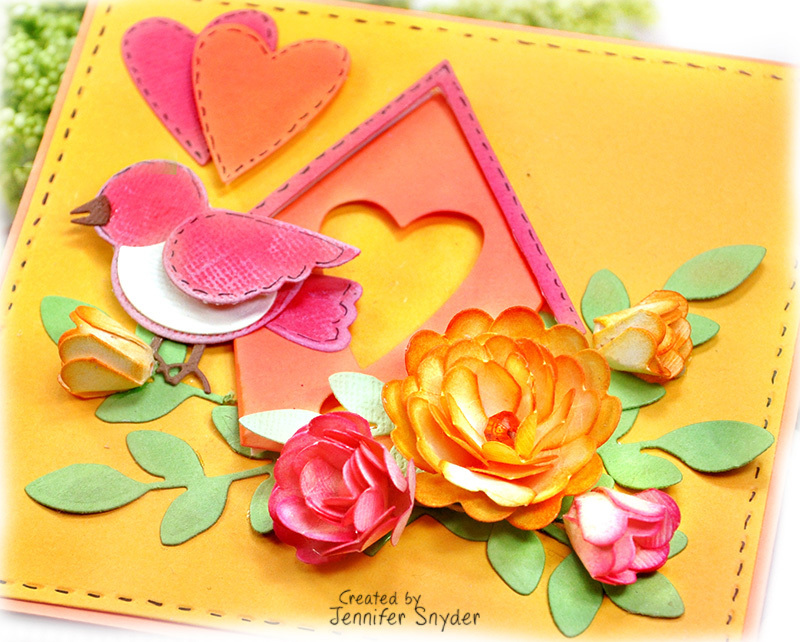 I have a few more samples using this same technique in upcoming posts. Stay tuned for some "Happy" posts. Have you played along with the Creative Embellishments challenges? 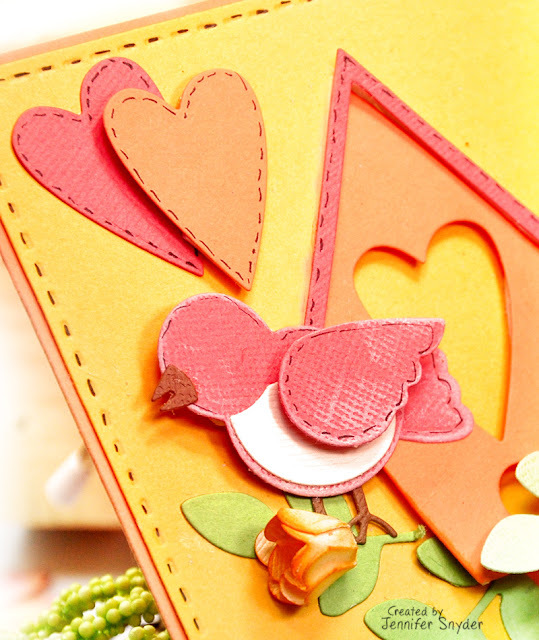 There's no easier way to win some great chipboard! 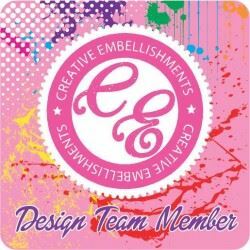 The great thing about the CE challenge is that your project is based on your interpretation - how the featured image makes you feel, what you sense and see. Maybe it's the colors that inspire you, or the patterns...totally up to you so nothing can be wrong. You can enter the challenge by uploading your work on the CE Facebook page. 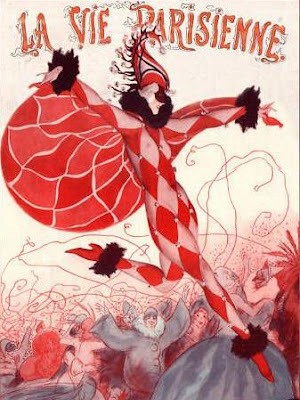 For me, the image is festive and happy. It reminds me of a party - sooooo that's my inspiration this month - celebration and birthday cards. 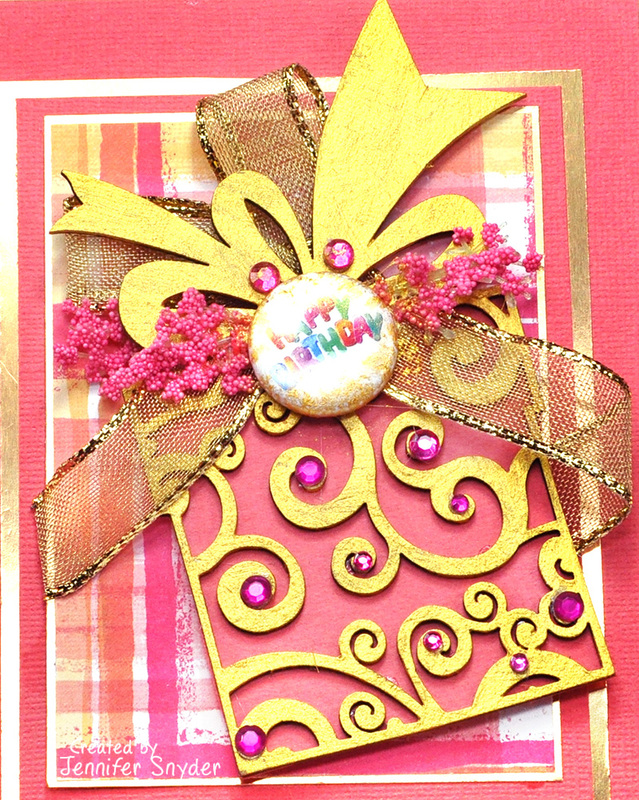 I used a combo of Creative Embellishment chipboard and flair buttons to adorn the festive cheery cards. 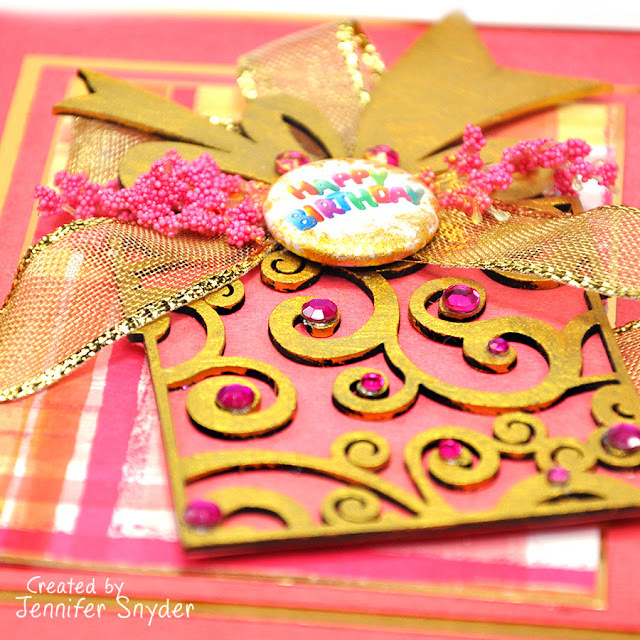 The first card features Flourish Presents painted with gold paint, and Happy Birthday Flair Buttons with edges also dabbed with gold paint to blend with the chippies. 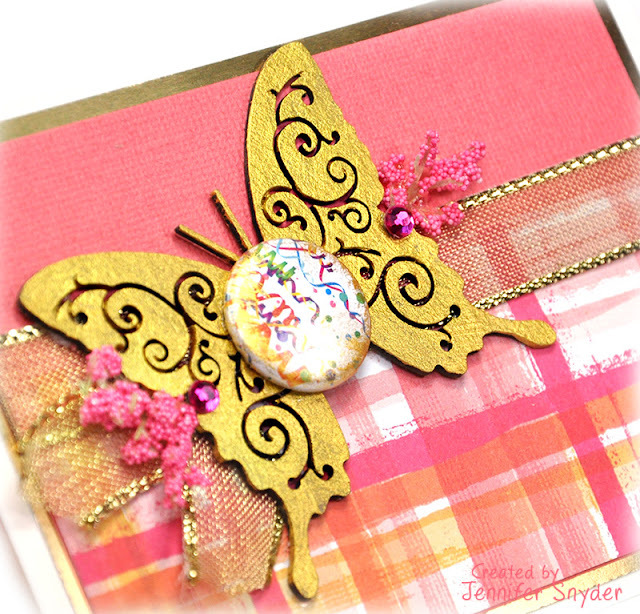 Flourish Butterflies and the Happy Birthday Flair Buttons. 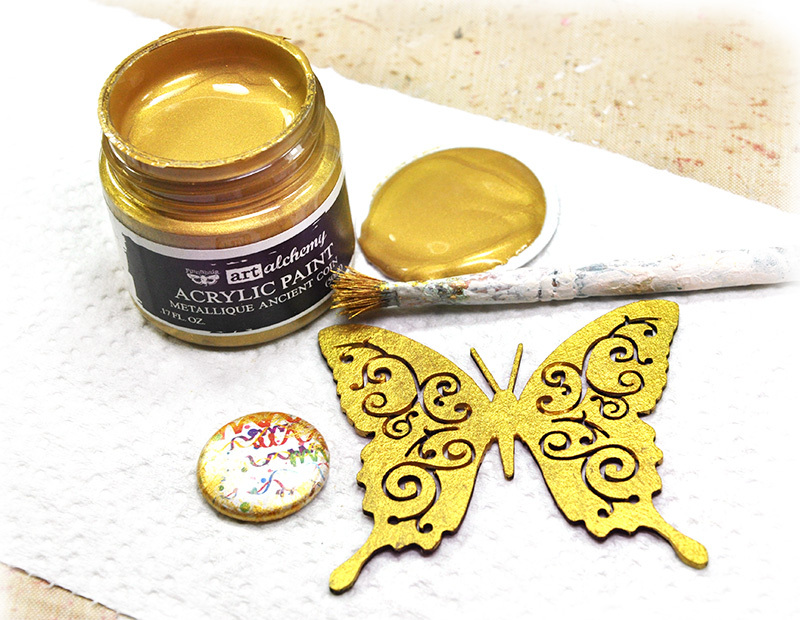 The gold paint used is Prima Finnabair's Art Alchemy - Acrylic Paint - Metallique Ancient Coin . It has a nice metallic finish - not glossy and not flat. 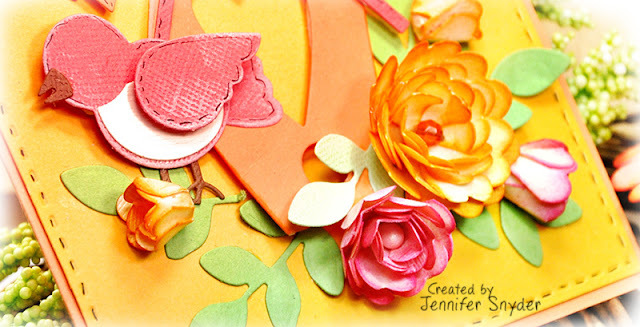 The paper used is from Hobby Lobby. 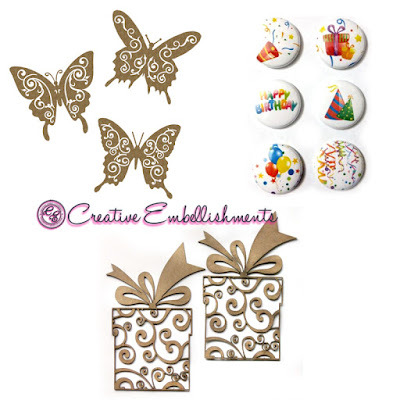 Shop for your Creative Embellishments flair buttons and chippies right here. 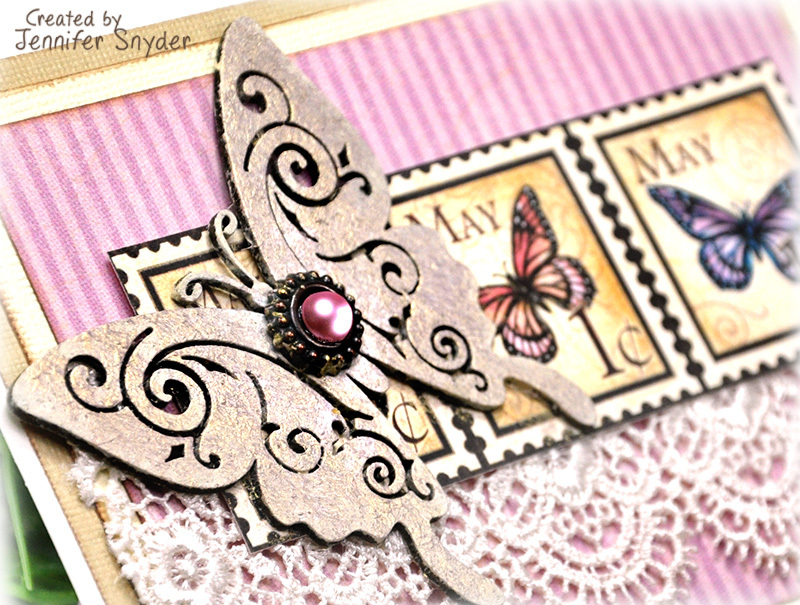 I've been playing with the newly released dies at Spellbinders from designers Tammy Tutterow and Becca Feeken. 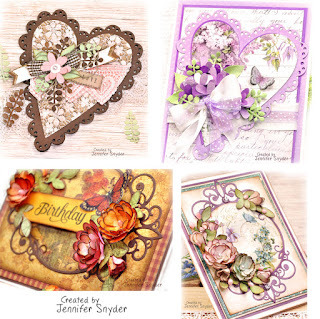 Sew sweet Collection by Tammy Tutterow and the Elegant 3D Vignettes collection by Becca Feeken. The die combo has been fun because both sets of dies allow the crafter to "build your own" fun, so to speak. 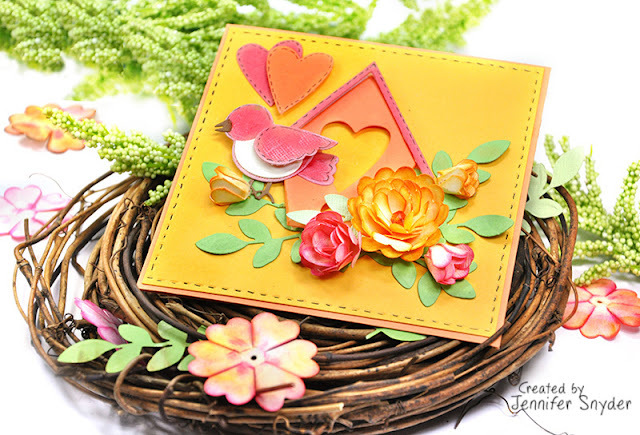 Today I'm using the Sew Spellbinders Sweet Tweets birdhouse dies - a set of wonderful "build your own" dies with bird house, bird and various embellishments. The birdhouse is being embellished with custom flowers made from Spellbinders Cinch and Go Flowers III , part of the Elegant 3D Vignettes collection by Becca Feeken/Amazing Paper Grace. This collection is all about the layering and dimension. I've recently featured other dies from the Sew sweet Collection by Tammy Tutterow and the Elegant 3D Vignettes collection by Becca Feeken.